Home > Social Media	> Hey Doc, Think your twitter account got hacked. Hey Doc, Think your twitter account got hacked. It is no news that any account can be hacked. In the past we have seen multiple celebrity twitter accounts being hacked and just today we saw Fox News Political Twitter account being hacked. 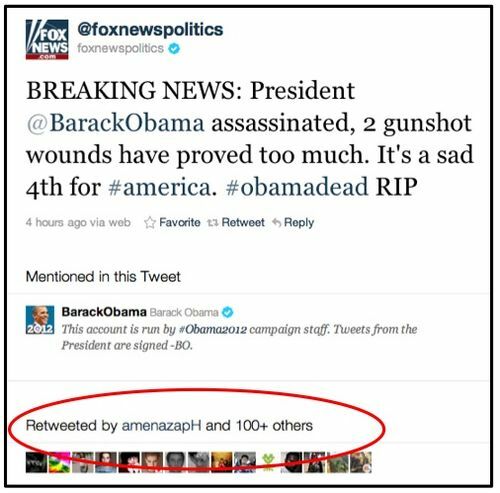 An account with 34,000 followers hacked spreading false news about President Obama being shot… Once this false news was tweeted it got retweeted y 100+ people. A very distasteful rumor was being spread fast but thankfully got caught on time. Ok, new, different scenario. How many times have you seen someone forgetting to logout of a facebook account? Twitter account? Any account? Multiple times I have witnessed pranks played on such accounts in the hospital or different settings. Before it was no big issue but as people start using SoMe more in professional way, the fact that someone can post an inappropriate remark or picture on your account can place you in an uncomfortable position and create a need to clarify the scenario to the people that “follow” you. Just a quick reminder to all of you logging in public computers. Make sure your username and passwords are not remembered. Use difficult passwords and change them often. Ex. Su$him@kiz%. At least that was one of mine in the past and I change them often. It may be uncomfortable but It would be more uncomfortable having someone posting embarrassing fake posts in your twitter or facebook account and then needing to clear it up to your followers. I have seen this multiple times in public computers in hospitals.